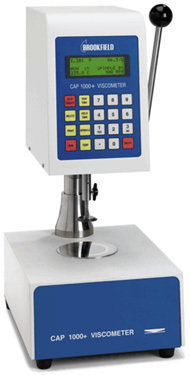 The CAP 1000+ Viscometer is appropriate for a wide range of materials, including Paints & Coatings, Adhesives & Sealants, Polymers & Resins, and more. Note: Viscosity ranges shown above are for illustration. The exact range will depend upon instrument configuration. When advanced sample analysis is required, Brookfield's Capcalc application software can "control" the CAP 2000+ Viscometer from any PC. Capcalc software provides automatic data capture and graphical data display to facilitate analysis of test samples. The software allows control of a sample's temperature for integrated viscosity/temp tests between 5°C and 75°C or between 50°C and 235°C, depending on the model you choose. 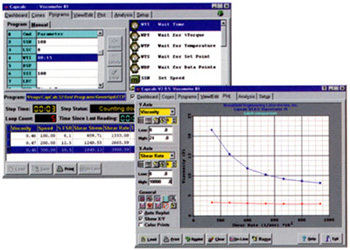 It also allows the user to specify speed ramps and/or temp ramps for more rigorous material testing. 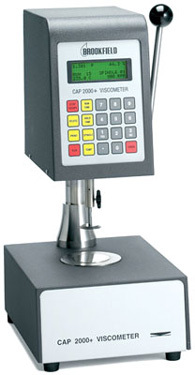 The CAP Viscometer is supplied with choice of one cone spindle. Choice of operating temperature range must also be specified with order: 5° C to 75° C, or 50° C to 200° C.
Accessories include: Certified Viscosity Standard Fluids which are necessary for performing calibration tests; additional standard cone spindles or custom designed spindles; Brookfield CAPCALC application software.All Brookfield Viscometers are guaranteed for one year against defects in materials and workmanship. Need Extended Range? - Order additional cones or optional torque range. High Torque (ICI Specifications): 181,000 dyne • cm, Low Torque: 7,970 dyne • cm (Automotive Paints) Comes standard with High Torque range - Low Torque (for Automotive Industry) also available. Order Brookfield Viscosity Standards to verify calibration. - Specific Standards for each cone are available. You can turn your CAP2000+ into a "Rheometer". - Order CAPCALC software. For calibrating CAP Series cones each spindle has its own fluid. Determine which viscometer is being used: High Torque or Low Torque. Determine which cone is being used.